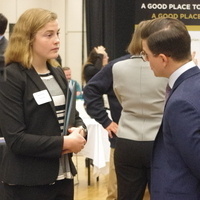 The Drake University Career Fair will be held, Thursday, Feb. 14, in the Olmsted Center. Meet with organizations and professional programs who are interested in recruiting Drake students. Don’t forget to bring copies of your resume! Open to only seniors and O3 students: 3 to 3:30 p.m.
Open to all students: 3:30 to 6 p.m.
Professional attire required. No jeans or sweatpants. Men: Suit and tie. If you don’t own a suit, wear trousers, a button down shirt, tie or blazer/sport-coat. Women: Suit, if you don’t own a suit, wear dress pants or a skirt and a nice blouse or sweater/blazer.